Everyone loves to watch and critique the Super Bowl ads. But how effective are the ads really? We took our brand new product Attribution powered by Foursquare, and measured which ads actually pushed people into stores. We found that in the week following the Super Bowl, Hyundai, the official auto sponsor of the NFL, topped the auto category in growth. Same for Taco Bell in its quickserve restaurant category. And the now-red-hot Red Lobster saw gains as well, thanks to Beyonce’s halftime rallying cry. Let’s dig deeper. In general, visits to car dealerships were down about 2% in the days following the Super Bowl when compared to visits during the two weeks before the game. Hyundai, however, saw a sizable increase in foot traffic by about 5%, bolstered by the brand’s four different ads, all of which were lauded by consumers and critics and took turns being named the favorite, most viral or engaging of all the Super Bowl car ads. Kia and Mini also performed strongly, showing ~3% and ~4% respective growth versus the two weeks prior to the game. Kia, part of the Hyundai Motor Group, supported its Walken Closet commercial starring Christopher Walken with a strong social media push. Strategically, Super Bowl auto ads are not typically a direct response play, but our data proves that attention-grabbing creative during the most-watched TV day of the year does drive visits to dealerships — and presumably, immediate purchase intent. Similarly, national Super Bowl advertiser Taco Bell and regional advertiser Jack in the Box both saw strong growth in visits in the week following the Super Bowl, with ~10% and 7% increases in visits. McDonald’s, which aired its ad just before kickoff, had a weaker relative percentage increase of 0.5%, but still drove about the same number of additional visits as Jack in the Box. No other major players in the fast food space advertised during the game, and as a category, they all had flat to slightly negative foot traffic in the same time period. Following Red Lobster’s announcement that Beyonce’s “Formation” release drove 33% incremental sales this Super Bowl Sunday versus last year, the momentum continued into mid-February: traffic grew 12% in the week following the Super Bowl. Valentine’s Day was also a big hit for the company’s U.S. restaurants — traffic was up 58% versus one week prior (which was Super Bowl Sunday) and 40% versus the prior Sunday (1/31/16). This growth was more significant than for any of its competitive set that we reviewed, including Olive Garden, Cheesecake Factory, Outback Steakhouse and PF Chang’s. The Beyonce effect was real. By now you might’ve put on your measurement cap and thought: “this is good, but how many of these people would have visited anyway, whether they had seen the Super Bowl promo or not?” The true measure of marketing effectiveness is incremental lift — how much the ads influenced people as compared to a demographically-similar control group of people who haven’t seen them. This is the key to understand the true efficacy of advertising. In the above example of the Super Bowl’s brand winners, we assume that most Americans watched the game and commercials, so rather than incremental lift, we compared visits with the prior weeks. But we have created a solution that allows us to measure true incremental lift of nearly any digital ad campaign. Today, we are proud to introduce Attribution powered by Foursquare. Attribution powered by Foursquare is the best tool to measure the conversion of media spend into real world visits to retail locations. In plain English, that means we can measure how much advertising actually leads people to go shopping in stores or dining in restaurants. Attribution powered by Foursquare can be easily integrated with nearly any digital ad campaign. And it can be used to measure nearly any digital media buy, whether it’s display, video, native or cross-device. In the past few months, we’ve successfully run about a dozen pilot tests with marketers, agencies, publishers, and programmatic partners, and we’re proud to launch with TGI Fridays, Brown-Forman, Flipboard, Drawbridge, and Adelphic. We’re excited today to open the doors for more brands, agencies and other partners to integrate Attribution powered by Foursquare into their campaigns. As we continue to work with partners to measure lift in visits, we’ll surely discover other trends and uncover new truths about advertising efficacy. Exactly how effective are promotional offers vs. brand messages? How does a focused holiday-weekend campaign fare against long-term sustainment efforts? How much can be spent before hitting diminishing returns? What’s the “next-7-day” incremental visit impact of video vs. standard display units, and are they worth the additional spend? With Attribution powered by Foursquare, we’ve unlocked the ability to truly understand how online ads result in offline shopping, finally connecting the online-to-offline dots. At Foursquare, we have better location intelligence than anyone in the world, with unparalleled scale and accuracy. We have the largest and most accurate foot traffic panel of millions of phones; 65 million crowd-sourced commercial locations in our database (used and trusted by 100K partners including Apple and Twitter); proprietary technology that senses when phones enter those locations; and a resulting one billion place visits observed every month — completely organic and non-incentivized. We link the digital and physical worlds by integrating a simple pixel within any digital ad unit, and then noting the frequency of visits to certain places, and how it differs between exposed and unexposed groups. Because our data is first-party, we can easily access and analyze it. Whereas industry standard analyses report weeks after a campaign is complete, we can deliver our reports as frequently as daily, giving marketers the ability to adjust all factors mid-campaign and optimize performance in near real-time. A sample Attribution report, which measures incremental list to an exposed audience and a control group. In addition to providing analysis on incremental lift via exposed and demographically-weighted control groups, we can even determine the path-to-purchase, places visited before and after, categorical behavior and competitive insights. Click here for more info or email us at attribution@foursquare.com. Like this article and follow our publication, and you’ll be the first to hear more news on the state of location intelligence. To determine foot traffic lift in this particular analysis, Foursquare looked at visits to auto dealerships, QSR restaurants and CDR restaurants for Super Bowl advertisers as well as non-advertising companies in the same industry segments during the six days following the Super Bowl (Monday — Saturday, 2/8–2/13) and compared it to total visits to the same venues in the six-day date range over the course of the two weeks prior to the Super Bowl (1/25–1/30 and 2/1–2/6). 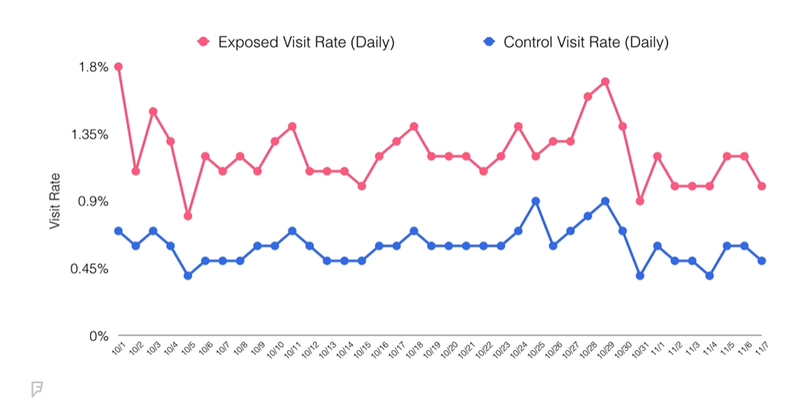 As Super Bowl Sunday is an abnormally low day for visits to these categories, Sunday data was removed. QSR and CDR restaurants are categorized based on proprietary chain data; car dealerships are categorized based on venue name. In select cases, there may be overlap across auto brands (eg. a BMW Mini dealership). Non-branded dealerships (eg. Frank’s Auto) were not included. Visit data is collected from a panel of Foursquare and Swarm app users who enable background location and represent the US Census demographics. Foursquare data is always anonymous and reviewed in the aggregate.